1989 has been a very good year for music. It's also been the year when many an old rocker from an earlier age, after turning out indifferent "product" to honour some contract, finally delivered the goods. Curiously, a lot of the best albums were released in the second half of the year -- did the stimulus of the end of the '80s galvinize musicians into finishing things off with a bang? One name which stands out this year is the French Canadian producer Daniel Lanois, who added to his previous credits (Robbie Robertson's solo album and U2's The Joshua Tree in '87), three of this year's finest -- Dylan's Oh Mercy, The Neville Brother's Yellow Moon, and his own haunting Acadie. So, without further ado, here's LIVEWIRE's "BAKER'S DOZEN"! 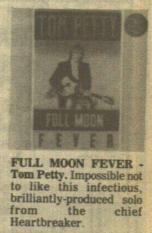 FULL MOON FEVER - Tom Petty. Impossible not to like this infectious, brilliantly-produced solo from the chief Heartbreaker.